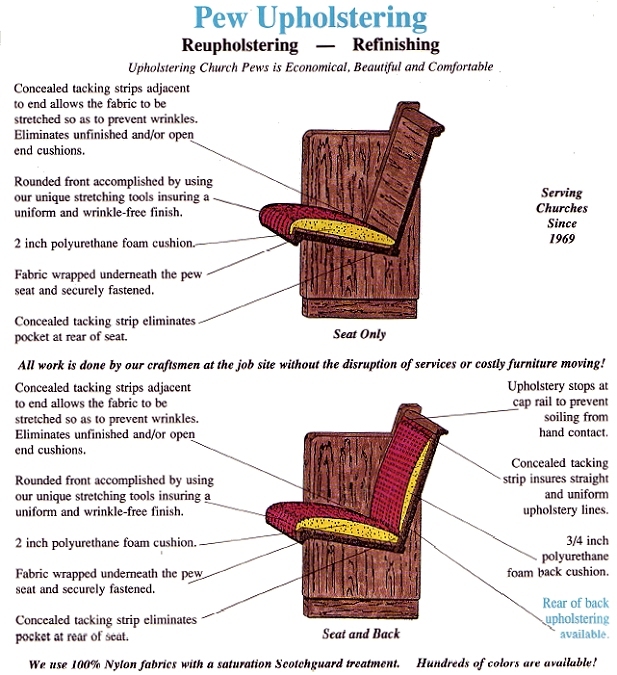 Upholstery and re-upholstery of pews is a quality service we offer here at A & O. We offer pew upholstery in your choice of seat only, the combination of seat and back, or seat, back, and back of back. Upholstering church pews is very economical. All work is done by our craftsmen at the job site without the disruption of services or costly furniture moving! We offer a wide variety of fabrics with over 300 different patterns and 4000 different colors in 100% nylon with 3M Scotchgard treatment by various manufacturers. The foam for seat the cushions can range from 2” – 3” thick virgin polyurethane and the backs range from 1” – 2” both with a 2.00 ILD and 50/60 compression ratio.